Do you ever look out at your class and see students checking email, text messaging, or simply sleeping? Let’s be honest, library instruction has the potential to be a bit boring. Why not spice it up and make it more interactive with Poll Everywhere? Give your students a fun option for in-class participation using their own cell phones. Poll Everywhere has two main types of polls: multiple choice and free text. The choices in multiple choice polls are set up by the instructor on the Poll Everywhere website and voted on via text message by the students. 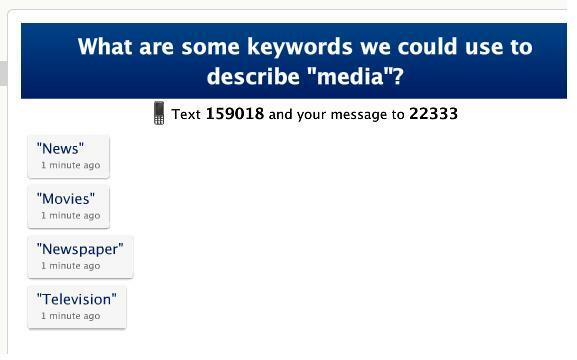 Like American Idol, your students can “vote” by simply texting a number or a keyword to a designated phone number. 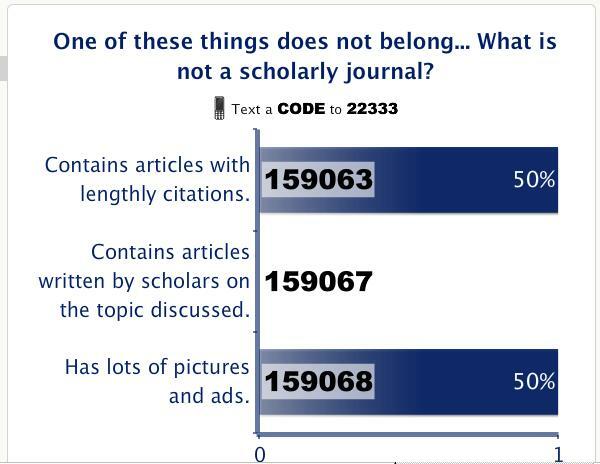 This type of poll could be used as a quick quiz to gauge student engagement or it could be used to provoke class discussion. The free text poll allows an instructor to ask a question and for students to text in their free text answers. This could be a great way to brainstorm keywords or to get feedback or answer questions that students might feel uncomfortable to ask. This could be especially for encouraging shy students to participate in discussions. Both poll types update in real time without much of a delay. Poll Everywhere has a variety of pricing options from free to $1400 a month (http://www.polleverywhere.com/plans). Their free version includes up to 30 responses per poll which could work for some classroom settings. For $15 a month you can bring that up to 50 responses. Both versions require participants to text in a number rather than a keyword, which could get confusing. For $65 a month, instructors can choose the keywords that students text for their answers. In general, I think Poll Everywhere could be a great (possibly free) alternative to clickers in the classroom setting. My only concern would be the cost to students. While many of our students have unlimited text message plans, some do not. Poll Everywhere does have one workaround; students can choose to vote via a website instead. This would, of course, only work in computer classrooms or for those who have unlimited data plans on their phones. I think that as long as the activity is not required, it could be a great tool for any kind of classroom or even presentation setting. Hope to see/ meet many of you at the ACRL conference this week!